Posted in Blog, Triathlon 2017, Project: Base Camp, Winter, on 17 December, 2017. Since our return to normality (boo), we’ve spent way too much time indoors. OK, we’ve been getting out as much as we can – cycling and running Kms towards our self-imposed challenge for this year, the Triathlon 2017 ,but one thing we’ve all been craving for a little while is a night away… in the outdoors. I guess the thing we’ve missed the most since relocating into a house is the reduced amount of time we spent TOGETHER in the OUTDOORS (two of our favourite words). So, despite a crappy weather forecast, we decided to get away, even if it was just for one night. We knew the therapy of a night away, running, cycling and generally getting a bit muddy and red-faced was what we all needed. 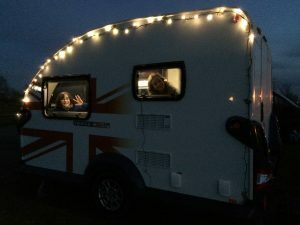 There was certainly no need to book a pitch this weekend – it seemed that not many other people were choosing to spend the night camping or caravanning. I bet I know where they were instead: stressed, rushed and spending too much money on Christmas presents in busy, artificially lit stores. This might be said with my tongue in my cheek as I know that we are by know means the only people that would rather spend a night outdoors as opposed to a day in the malls – we met some lovely people that we re doing just that – but the pressure of Christmas is a difficult force to fight. We are so glad that we saw the light and decided to JEDI (Just ‘Efin Do It). Plenty of the room at the inn tonight! Last year we decided to set ourselves a challenge; to complete 2017 Kms by foot, on bike and by wild swim… a family challenge that we’d all contribute towards. Here’s the reasoning behind it. Anyone who knows us knows that our family challenges are nothing other than ideas we come up with to ensure we keep getting outside, together, regularly to enjoy some exercise, chat and fun… while getting hot, sweaty and windswept in the process. The Triathlon 2017 was concocted exactly for those reasons. Getting away this weekend may not have happened if we didn’t have such a challenge set? Actually, that’s not strictly true as we would have come away anyway because we have set ourselves another challenge: to not hibernate in the Winter! You see, humans are not meant to hibernate away like hedgehogs over the dark, cold months of Autumn and Winter. No – humans can put coats and jumpers on, and waterproof layers, that make them an all-year-round kind of species. Humans should say Nay to Hibernating; or #hiberNAY for short!